Posted on 2017-12-03 by Eric Britton Tagged 2017AyresCrisisFinanceLatest	Comments2 Comments on WHY THE REPUBLICAN TAX BILL SHOULD FAIL IMMEDIATELY. WHY THE REPUBLICAN TAX BILL SHOULD FAIL IMMEDIATELY. Tax cuts, wages and salaries: Will lower taxes help workers? And the economy? 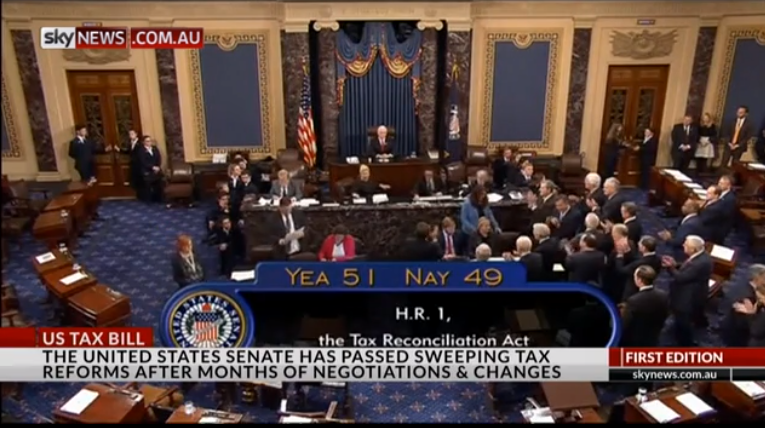 For several weeks, the guest experts on CNBC and Bloomberg News have been talking about the coming tax cut legislation (for corporations) that the Republicans finally seem to have in their grasp. The Bill, as it is currently proposed, will eliminate the insurance mandate for health care and may leave quite a lot of upper middle class salaried people, worse off, especially in high tax states. The sure winners will be the shareholders of multinational corporations and “pass through” enterprises, especially real estate partnerships. The “supply-side” cheerleaders for the plan, both in Congress and the White House (Mnuchin, Cohen, Mulvaney, et al) argue that economic growth be much faster, that it will pay for the cuts, and that wages and salaries will rise, thanks to a burst of new investment. By contrast, virtually all top economists say that the cuts won’t pay for themselves, that the deficit and the national debt will increase, and that growth will not accelerate. What both sides agree on is that there is around $2.8 trillion in profits sitting out there in overseas banks, mostly in tax havens, just to avoid paying US corporate taxes. Apple, alone, allegedly has $260 billion to bring home, if only Uncle Sam would kindly cut his share. The plan being discussed by the 112th (current) Congress would reduce the corporate tax rate on foreign corporate profits repatriated as dividends. A “tax holiday” to bring back profits being held overseas was tried by the second Bush administration in 2005 as part of The American Jobs Creation Act (PL 108-357). The tax rate for funds repatriated under the Act was set at 5.25% (a one-time 85% discount on the 35% top US corporate Income tax rate. The corporate promoters and their lobbyists said that 500,000 new jobs would be created in 2 years. Here is what actually happened in 2005. During the next year $299 billion was repatriated by 843 companies (out of 9700 companies that were eligible).Of this amount, $99 billion was repatriated by pharmaceutical companies (32% of the total), $58 billion was repatriated by computers and electronic equipment firms (18%). That compares to around $60 billion per year (on average) of total repatriations of foreign earnings by all companies, during the previous 5 years. How many new jobs were created? The top 15 repatriating companies reduced their total US employment by 20,931 jobs (about 35%) between 2004 and 2007. (A few companies reported increased employment, but only because of acquisitions). R&D by the top 15 decreased slightly even though six of the top eight were pharmaceutical companies (and those companies are notoriously dependent on R&D). Two academic studies, based on data from the whole set of repatriating firms concluded that repatriation in 2005 had no positive effect on R&D expenditure (Blouin and Krull 2009, Dharmapala, Foley, and Forbes 2011). Use of repatriated funds for share buybacks was explicitly prohibited by the Jobs Creation Act of 2004. But, strangely, share repurchases by 19 major repatriating firms surveyed (including the top 15) increased from $2.2 billion (average) in 2003 to $2.5 billion (average) in 2005 and jumped to $5.3 billion (average) in 2007. Share buybacks and executive compensation were the only expenditure category that increased as a result of the repatriations. One study found that, for every $1 of repatriated funds, between 0.60 and $0.92 went into buybacks (Dharmapala, Foley, and Forbes 2011). Buybacks do nothing at all to increase employment. It seems that corporations could – and did– legally use the repatriated funds in the “allowed” areas while moving previously budgeted corporate funds away from those areas (i.e. R&D) to use for the buybacks (Levin et al. 2011) p.23, footnote 61. However, it must be acknowledged that buybacks, by company, were quite variable from year to year between 2002 and 2007; see (Levin et al. 2011) Appendix, Table2. Executive compensation was the other expenditure category that increased dramatically in most of the surveyed corporations. Only one of 19 firms surveyed (Motorola) reduced executive pay between 2004 and 2007, and that was for other reasons. 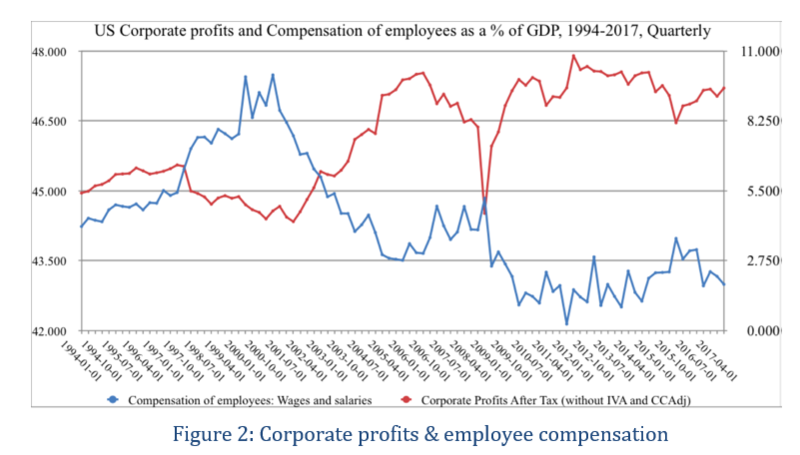 Collective executive compensation for 19 companies surveyed increased by 35% in the year after the repatriation (from 2005 to 2006), whereas worker compensation increased by only 5%. (Executive pay for the group of 19 decreased slightly from 2006-to 2007, primarily due to an enormous decrease in one company, Hewlett-Packard. Did GDP growth accelerate after the 2005 Bush tax holiday and other Bush tax cuts? It did not. In fact, the rate of US growth fell sharply. The chart below (from the St. Louis Federal Reserve Bank) tells the story. GDP growth peaked at 4.8 % p.a. in 1967. That peak (driven by spending borrowed money during the Viet Nam War) kicked off a persistent inflation. Real economic growth stayed near 4.5 percent from 1965 until 1973, after the first “oil shock”, and then started to fall partly due to oil price increases. Economic growth still hovered around 3.1% p.a. through the rest of the 1970s. That period ended with the second oil crisis (Iran) and the inflation was stopped by Paul Volker’s “inflation expectations killer” interest rate spike in the spring of 1983. 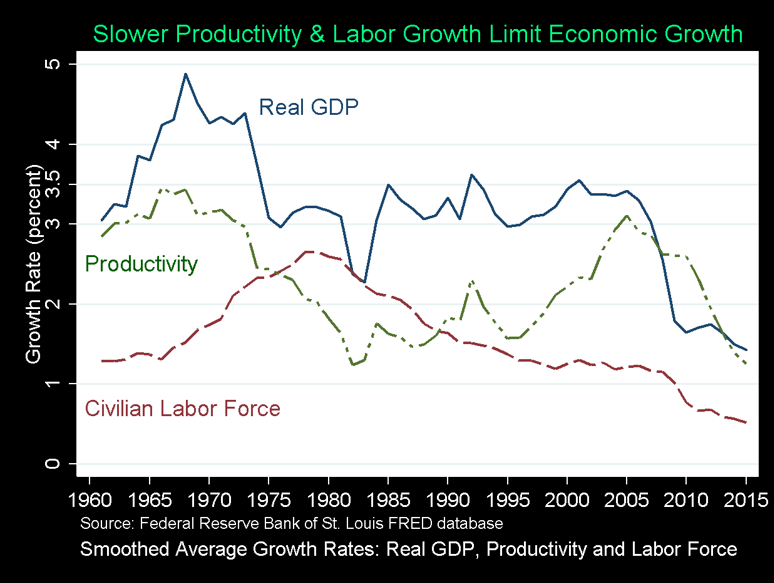 But the rate of productivity growth fell steadily from the in 1965-67 to a low in 1982-3. That interest rate spike in 1982 caused a deep but short recession in the US (and an economic crisis in Latin America). There was a rapid recovery starting in 1984 due to falling interest rates and very low oil prices in 1985-86 (but attributed by all Republicans – but very few economists — to Reagan’s tax cuts). Productivity started to recover (but unevenly) in the 1980s to another peak in 2005. Most economists attribute this upward trend in productivity to the penetration of computers and digital technology into business management. But, perhaps surprisingly, the internet revolution that began in the 1990s has not resulted in measurable productivity gains. N.B. growth still hovered around the 3% p.a. level between 1986 until 2005. It actually peaked at just over 3.5% in 1992 and again in 2001 (right after the Dot.Com stock-market crash). After that crash there was a very mild recession. In 2003 the Fed, under Chairman Greenspan, initiated a series of interest rate cuts, intended to stimulate growth. That mild recession also stimulated George Bush and the Republican Congress to try, once again, the “supply-side” theory (Stockman 2013). The American Jobs Creation Act of 2004, was supposed to bring back a lot of capital sitting in banks overseas to escape US Corporate Income taxes and induce another Reaganesque growth spurt. But, instead, after 2005 economic growth fell sharply from 3% p.a. in 2005 through 2006 and 2007 to around 1.5 % p.a. in 2008-9. There was no re-acceleration of growth until the first “green shoots” in 2016, when US unemployment finally dipped below 5%. Now I come to the crux of the matter. Corporate profits are currently at an all-time high, in absolute terms. Most market watchers expect to see even higher corporate profits next year, even without the proposed tax cut. Of course the economy has grown, too, but as a fraction of GDP, corporate profits after taxes (red) have increased from 4.5% of GDP in 2001 to more than 9% of GDP in 2017. Meanwhile salaries and wages (blue) have declined as a fraction of GDP, from about 47 % of GDP in 1994 to 43% of GDP in 2017. The relationship is not perfectly symmetric over long periods, but since 2001 most of the dollars added to corporate profits have almost literally come out of the pockets of employees. Why is that? It is because – as every reader of the Wall Street Journal and the other business press knows, companies typically increase their profits by cutting costs. Cutting costs generally means cutting jobs. The notion that future increases in corporate profits will simultaneously add to employee paychecks is contrary to both experience and logic. There is more to be said about the causes of economic growth, of course. Economic growth is driven by investment, after some lag-time. Money for investment comes either from the current profits of businesses, or from consumer savings, or from corporate (or government) borrowing against future profits. There is no other possibility. The historical evidence tells us that borrowing against future expected profits is the primary (and increasing) source of investment capital. But beware: the legacy of past borrowing to invest in past economic growth remains in the form of existing debt, which has also been rising since 1982. Existing corporate and government debt – consisting mostly of long-term bonds — is being paid off constantly at rates of interest set when the bond was sold. Consumer debt, on the other hand, consists mostly (70%) of home mortgages, plus some education debt and short-term credit-card debt. Some past US government borrowing was used to finance Federal, State and municipal budget deficits, and trade deficits. Investment in new productive capacity (“bricks and mortar”) is financed by corporate profits or borrowing (selling bonds). Finally, there is financial debt, mostly by banks, hedge funds and private equity groups, enabling companies to buy other companies. Financial debt has also risen sharply since 1982. So, existing debt is what financed past wars, past budget or trade deficits and past investments in economic growth. Existing debt is being paid off, year by year, just as mortgage debt is paid off over time, by borrowers. But the cost of debt service comes out of current income. A debtor may decide to accelerate its payments, as a homeowner may decide to pay off his/her mortgage early) so as to reduce the current debt service load. But debt repayment in the absence of increased income, means there will be less money available for new investment. This truism applies at all levels. If we (as a nation) decide to pay off the existing national debt faster there will be less money for other government services, including new capital investment, such as infra-structure repairs and upgrades. Other things being equal, that means slower growth. The essential point is that faster economic growth does require increased investment. That, in turn, necessarily implies more – not less – borrowing. Corporate leaders who want to pay less in taxes, are proposing to cut government revenues, resulting in austerity: reduced services or more borrowing to fill the federal budget gap, or both. Can the gap be filled by federal spending cuts, as Congressman Ryan (and other “debt hawks” ) hope? If the spending cuts come out of social services, such as health care and pensions – which is what most Republicans advocate – it means that people now depending on those services will have less income, even if they also pay a little less in income taxes. To complicate the situation further, the Federal Reserve Bank (FRB) is now (2017) starting to sell back into the bond-market the several trillion dollars of securities (government and corporate bonds) that it bought during the three periods of “quantitative easing” (QE). When that QE policy was in effect, the FRB was effectively underwriting the commercial banks capital reserves (by giving them cash to buy other securities to maintain their reserves) and, thus enable them to make more loans to businesses. But now that US unemployment is close to 4% p.a. the FRB has started to reverse this “easing” policy i.e. to resell the bonds it bought a few years ago. To buy them back, the banks will have less money available to lend to small businesses. What was a growth “tailwind” a few years ago is now a growth “headwind”. In summary, there is no evidence that cutting corporate taxes will result in increased investment in “bricks and mortar” projects, to make useful products, or in R&D. That did not happen after the 2005 tax holiday, and the financial incentives that operated then are still in place. The money brought back from overseas tax havens in 2018 or 2019 will mostly be spent on share buybacks, executive compensation and dividends to shareholders. The buybacks will drive up share prices further and accelerate the current “bull market” in corporate equities. Pensioners will gain, as long as the music keeps playing. But the end result will be another euphoric “bubble”, comparable to the ones in 1929 and 1999. When retail investors start to borrow money to buy stocks, on margin, the end is near. After such a bubble comes the inevitable crash, when the small “mom and pop” investors get hurt the most. And the next crash will be very painful, possibly worse than the Great Depression. One can only hope that it will be painful enough to encourage and allow some fundamental changes in the current forms and structures of capitalism, starting with US election reform. This entry was posted in 2017, Economics, Editorials, Finance, Stock market and tagged 2017, Ayres, Crisis, Finance, Latest. Bookmark the permalink. •	Would have liked Bob to present (briefly) what might be ominous of the final outcome of all this? Where is the US going if the bill is enacted? What is the horror scenario that is being prepared here? My hypothesis: current and future generations sacrificed! •	My final comment: this article belongs to what used to be the field of political economy (which included both what now is separated into micro and macro-economics). The two fields became separated into two, with little interaction. Micro people got obsessed with general equilibrium theory that stated that a market economy (if indeed complete, and without externalities) could replicate any welfare optimum. But the big omission is that this required a redistribution of endowments. This redistribution is now occurring, but in the wrong direction! So it is good that political economists got eliminated and so they would not scream too loud! Thanks, Bob, for your commentary and charts – which I attach so additional addressees will be able to read it. I’m sure you share my incredulity that Senate Republicans dared pass such a messy and contradictory tax bill of that importance. Since the House will almost immediately approve it and DJT will sign it into law, we are going to have to live with it for a long time. Let’s hope there is a big political price to be paid by the Republicans in the mid-terms. I liked your demolition of the claims for what “W’s” 2005 American Jobs Creation Act would do for the amount of overseas profits repatriated; capital spending by the repatriating companies; and how they thumbed their noses at the prohibition on share buybacks. Your skepticism about the new tax “reform” impact on economic growth is fully justified. At a meeting last spring of the National Economists Club, the Director of the CBO responded to my question about the CBO’s current assumption of potential GDP growth being only 1.8% a.r. until 2027. He cited the following reasons: The secular slowdown in labor and capital productivity, ageing of the population and slowing of net immigration and the fact that the last two are slowing growth of the labor force. I would add that the U.S. failure to save more (a reflection of private consumption being 70% of GDP and perpetual government deficits) is one of the principal brakes on capital spending which would boost productivity. I attach the CBO’s July 2017 forecast for potential GDP growth which the Republicans constantly deny. Politically, I find it ironic that the Repugs who prevented the ACA from being gutted/repealed, voted for the tax bill which will eliminate the ACA mandate and thus seriously impair ACA health insurance for millions. They must be desperately worried about the 2018 mid-terms to do such a humiliating about-face. We can also be certain that as soon as DJT signs the bill into law and the corporate sector and 1% crowd get their permanent tax cuts, that the Republican deficit hawks, who went silent on the tax “reform’s” impact on the budget deficit, will soon insist that the deficits be reduced by … cutting our social safety net: Medicaid, Medicare and Social Security. Where we go from here is a good question. Your concluding points about corporate profits and what I agree are growing market bubbles, are important for the outlook. A major stock market correction of 20% would cause an economic slowdown and rising unemployment in 2018-19. I wonder who our witless voters would blame for that in the mid-terms ? Below is the Committee for a Responsible Federal Budget (CRFB) which does excellent non-partisan analysis of the impact of fiscal measures on the CBO’s ten-year baseline scenario. The group includes Volcker, Simpson, Bowles and other top fiscal experts. It is a good piece, Bob, and I hope it gets wider play. Pall Horne was Smith Barney’s chief international economist based in Paris 24 years, then a managing director and the equity markets economist of its successor, Salomon Smith Barney in London until 2001 when I retired. I bill myself as an Independent International Market Economist; am on the board of several U.S. think tanks and still belong to France’s Societe d’Economie Politique. ← After the great repatriation . . . ?